Nothing like a good cry of a Saturday evening, is there? 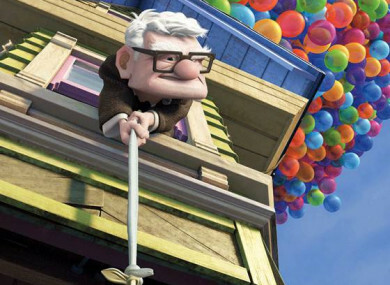 Up follows the story of an old man who attaches thousands of balloons to his house so he can fly it to South America, and fulfil his late wife’s dream of exploring the jungle. However, once airborne, he finds he has an unwanted stowaway in the shape of an excitable boy scout. There’s similarly cheery viewing over on RTÉ Two later in the evening, but it does boast a stellar cast with Jack O’Connell and Domhnall Gleeson. An Olympic athlete enlists in the US Air Force during the Second World War. When his plane is shot down, he and two crewmates survive for 33 days lost at sea. Worse is to come when they are captured by Japanese forces, and he endures brutal treatment in a PoW camp run by an infamous war criminal. If you’re going for something less morose, with more jazz hands, IGT should do the trick. Lucy Kennedy hosts the talent show, with judges Louis Walsh, Michelle Visage, Jason Byrne and Denise Van Outen assessing two magicians and a Dublin dance act. New series. Our fave architect visits some of the most unusual properties around the world, beginning in Sydney with a cave-like hillside home and one of Australia’s most iconic houses. Joanna Lumley hosts the award ceremony from the Royal Albert Hall. Films in the running for awards this year include The Favourite, with nominations in 12 different categories, as well as Bohemian Rhapsody, First Man, Roma, A Star Is Born, BlacKkKlansman, Vice, Green Book, Cold War, Can You Ever Forgive Me?, Mary Poppins Returns, Mary Queen Of Scots and Stan & Ollie. Will Barry Keoghan take home the BAFTA for Rising Star? The Greatest Dancer (BBC One, 7.35pm) The competition continues as the remaining eight acts take to the stage for another of the live challenge shows. Captain America: The First Avenger (E4, 6.40pm) Superhero adventure, with Chris Evans (both little and large) Hugo Weaving, Hayley Atwell and Tommy Lee Jones. Bad Neighbours (E4, 9.00pm) Comedy, starring Seth Rogen, Zac Efron and Rose Byrne. Dancing With The Stars (RTÉ One, 6.30pm) It’s Switch Up week! Call The Midwife (BBC One, 8.00pm) Dr Turner opens a new screening clinic for cervical cancer, and one of the first patients is a woman who is about to be married and has never had a period. First Dates Ireland (RTÉ Two, 11.00pm) Another chance to see this week’s daters.